And this is the day I eagerly await each year – the eagerly awaited Pantone Colour of the Year announcement! You may think I am crazy but this colour has a massive impact on many things you will see and purchase in 2018, from interiors to fashion, to beauty and of course weddings. In 2016, for the first time ever, Pantone had 2 complimenting colours – Rose Quartz & Serenity Blue. In 2017, the colour of the year was Greenery, and we have seen how that has made a huge impact this year and this trend will certainly continue. So now it is over to Ultra Violet – The 2018 Pantone Colour of the Year. I am really looking forward to welcoming this pop of colour and all its variations. Pastels have been trending for quite some time so I really cannot wait to see where and how Ultra Violet will pop up. This Ultra Violet colour is a symbol of mindfulness, artistic brilliance, individuality and spirituality. The deep purple colour perfectly compliments a winter wedding when you think about cold and perhaps snowy conditions. You could use this colour as an accent or as your primary colour. From flowers, bridesmaid dresses, ribbons, table settings and more, there are lots of ways to draw this colour in, or shades of it. This would also be a lovely colour for a Spring wedding. Think of how beautiful a bouquet of deep purple tulips would be. 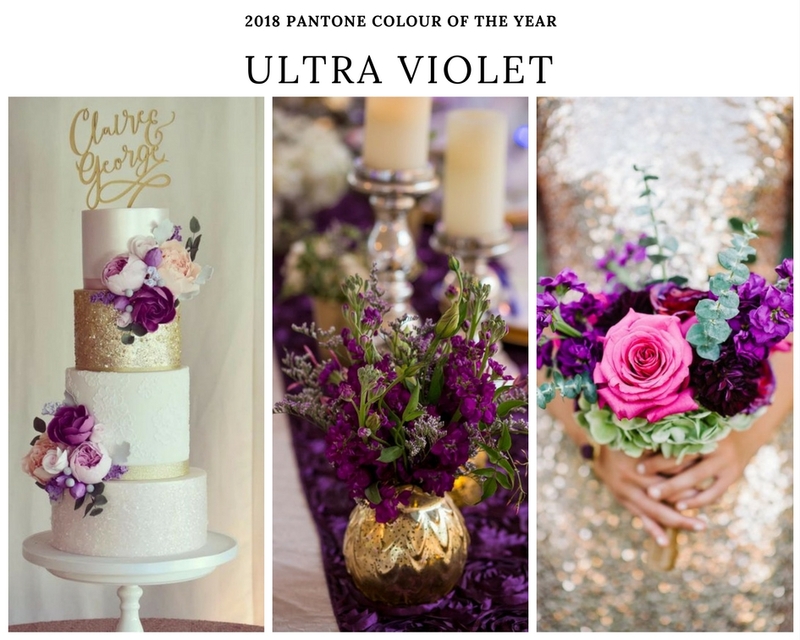 No matter what time of year you plan to get married, accenting with Ultra Violet would be beautiful!